According to the Wikipedia article on the subject, the first “Earth Day” held on 22 April 1970 was an environmental “teach in” scheduled during Spring break so more students could attend. The mastermind behind it was apparently US Senator Gaylord Nelson. However, six months earlier, an Earth Day to be observed on the Spring Equinox was proposed to UNESCO by Christian peace activist John McConnell. The idea was supported by U Thant and subsequent UN Secretaries General, and March 20th is still the official date for the UN’s version of Earth Day. In the United States, the April 22 observation date persists. When I am not working, thinking about work, working on my own projects, or trying to follow the news that NPR does not want to touch but which I think is important, I am probably trying to rest. When I rest I often experience light dreams. These often involve buildings, and recent dreams have been no exception. It could be that one reason I don’t much like to sleep is that I don’t much enjoy this type of dreaming. The images or thoughts can be disturbing or scary. They sometimes swarm in, but in a gentler way than when I am sick or passing out. Have you ever had a fever or passed out, and experienced a kind of mental noise that can seem like a rather large chattering crowd? But like when I have been sick, these dreams often carry with them the suggestion that there is some important problem to be figured out. Yet the data or images that arise make no real sense and are basically just confusing. It is a very interesting experience, and basically mimics the experience of being suppressed by a criminal. I have had dreams that were quite tolerable. But these odder and more confusing episodes are more common. Many have involved rather large inside spaces that seem to go on forever and tend to present odd surprises and changes. After a recent one, I resolved to write a bit about this, and call the section “dream house,” a play on words connected with my occasional interest in designing architectural spaces. 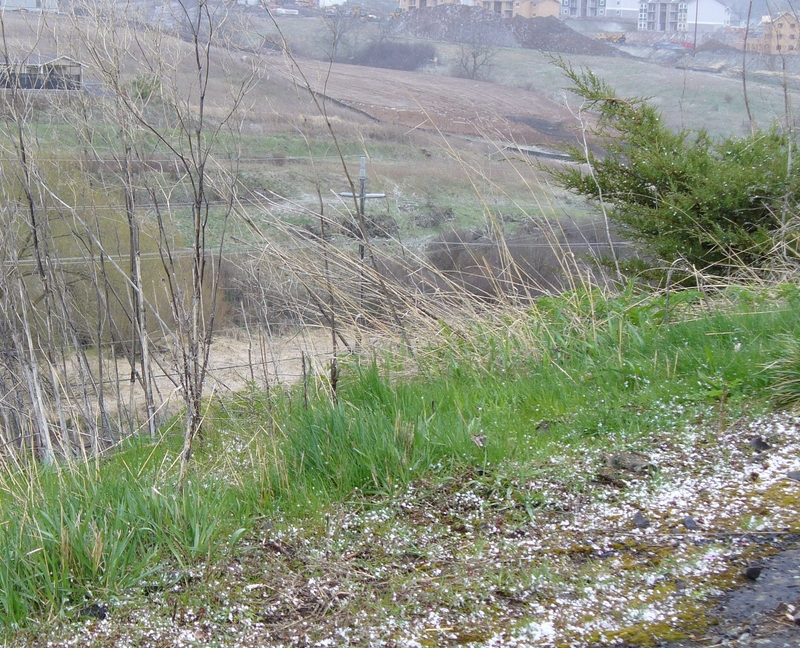 “Snow” melting on the ground. I was on my way home after finding a great used FM tuner at Palouse Treasures and forgetting to buy more solder at Radio Shack. It was about 1pm. And as I rode my bike that last half mile back home, the skies opened up! But what fell down from those dark clouds on this cool Spring day? Rain, right? And I came home all wet and had to change my clothes…Nope. As pictured above, it was something more like snow. Riding through it, it felt sort of like little bits of styrofoam. It was little icy pellets, but they weren’t hard. They bounced on the ground like popcorn. “I want to get a picture of this!” I thought, and after parking my bike on the tarp I have for it just inside the door, I went and got my camera and stepped back outside. The “stuff” had been falling in sheets! But now it was mostly gone. I walked up the hill a bit and found some still visible on the grass beside the driveway. And then I noticed more lodged in the junipers that serve as our landscaping here. And so I got a few more photos of the stuff before it all turned back into liquid water. 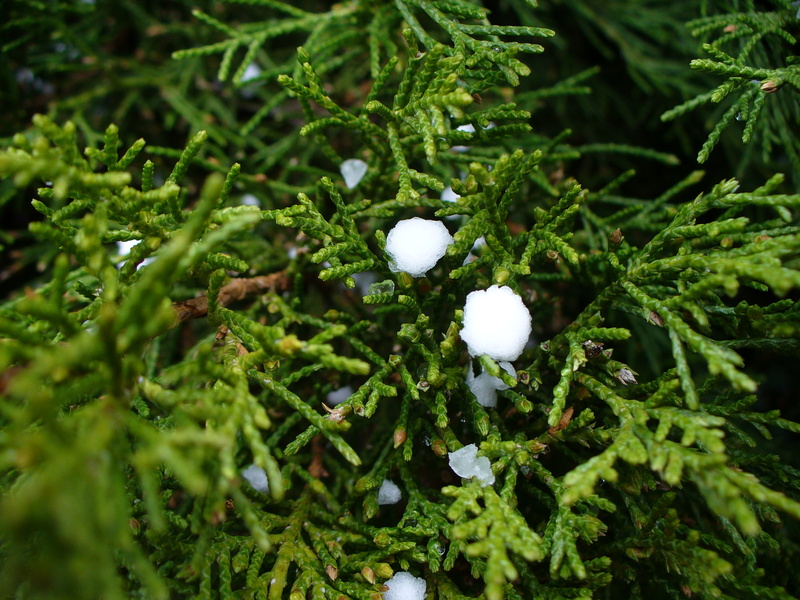 Our “snow” caught in the juniper just before melting. We do far too little of it at work. Production Troubleshooting is a study in the perfection of COPE. At home I get some chance to indulge myself. And though I still feel miles away from any scene one could consider “ideal,” at least now I can see some movement in that direction. Like the nice new (used) FM tuner I got today for $13 (I bought it because it had a power connector on it that I needed for another project; that it works it just gravy!). Make several real tables using IKEA table legs. These are my favorite table legs because they work and they are also easily removable. I finally got around to ordering a dozen (they cost $3 each plus shipping) so now have a second real table (in the bedroom, where I am now) and legs for two more 2-foot by 4-foot wood tops which have yet to materialize. Put heavier projects (power supplies with transformers) in boxes on the floor, while most projects are closer to table height, to make the front panels accessible. I found some cool aluminum enclosures on eBay and got two. Perfect for this purpose. Recently some parts needed to complete them came in, so they are becoming useable. More furnishings (for my living room). My plan is to make the living room into a study area with three sections. One for the arts, one for science and electronics, and one for Scientology. The area needs tables (above), shelves, and chairs. But I didn’t want heavy furniture, and one night I thought: “I wonder if they make inflatable furniture?” And they do! So I am going to try some. Electronics projects sort-out. These were in some disarray, as I was coping for so long with either too little time or too little finances. Now they can begin to move forward in a more orderly manner. My box of manual controllers (called “faders” in the business) is now ready, and the old circular display has been upgraded so it’s easier to use. It will eventually be joined by other displays that operate in different modes, and one will be very video-like. Computers sort-out. I no longer feel the need to access the internet on a different computer from the one I store all my files on. So that older computer is being re-purposed into an experimental computer for the “learning room.” My under-used little netbox will now serve as my electronics bench computer, and my two portables will eventually be deployed at the other learning stations. My “main” computer was recently upgraded from 1GB of RAM (Random Access Memory) to nearly 4GB and the difference is really noticeable. Besides the fact that my phone line is quite noisy, the DSL connection to the internet works well, so for the time being, that’s all good. Yes, these are the results of letting an electronics hobbyist with an income loose in a 2-room apartment!